Smart purchasing of wheat is vital for the profitable and sustainable running of any flour mill because it is intrinsically linked with grain price through mill operational protocols and customer expectations. Wheat procurement and purchase, however, involve both risk and considerable amount of investment both in time and mony. The fact that wheat has become a major commodity in world markets can result in high price volatility. It therefore becomes more important to purchase through reputable exporters or intermediaries. Inherent knowledge of the origin, source and specification of any given wheat is also extremely important. Contracts involving international transportation often contain abbreviated trade terms that determines which party (buyer or seller) owns the responsibility for the loading, shipping and insurance costs as well as when the risk of loss shifts from the seller to the buyer. Generally speaking, most wheat is traded in a FOB (Free on Board) basis-wherein the sale is considered complete at the seller’s shipping dock and thus the buyer is responsible for freight costs and liability (also known as FOB-origin). Other contract terms exists. Buyers who want to avoid the hassles of chartering vessels may want to consider CFR (Cost and Freight) or CIF arranges for the carriage of goods by sea to a port of destination and provides the buyer with the documents necessary to obtain the goods from the carrier. Same is true for CIF, the difference being in that the latter the seller is responsible for buying marine insurance against the risk of loss or damage to the goods during transit (liability), whereas in the former contract type this is not the case. Traditionally, FOB prices for wheat are quoted is US dollars with payment made in the same currency against a Letter of Credit (LC). The LC incurs higher bank charges but also assures the seller that the shipment will be paid for. Buyers and sellers who have over the years developed an understanding may consider direct payment to save costs. There are many ways to understand and thus adopt the approach to wheat purchasing as shown in table above, both moisture and extraction rate have been allocated a predetermined value of 12% and 80% respectively, extensive knowledge and experience has shown this to be an excellent starting point for comparison. The link between test weight (TW) and extraction rate is well documented and facilitates the introduction of ‘cost at 1st break’. In other words, it reflects how much it costs each mill to get the wheat from purchase source onto their 1st break rollers. The number of mutable parameters is many and varied. Further, moisture and foreign matter (FM), the cost of shipping water and screenings across the globe may soon add up. At first glance looking only at protein and the subsequent FOB price for the two wheats in picture above. It appears that the German 12 is not only cheaper but potentially the most economical choice-particularly with a USD 32 spread. The breakdown of cost, however, is not quite as simple as that. Once additional freight charges come into play, an allowance is made for nearly double the level of screenings and when the lower TW and resulting loss in extraction is taken into account, the actual bottom line cost comes out in favor of AH 12. Cost at 1st break is just one way of predetermining cost. There are many others-1st break raw, protein on a moisture free basis (MFB), wet gluten (WG), extraction ration and even baking score-which allude to end user considerations and expectations. The primary driver behind sustainable wheat sourcing has always been to achieve a reduction in protein costs and to attain a positive result in mill profitability by doing so. The combination of a number of wheat from various origins in the gristing process is fairly common practice in the milling industry. 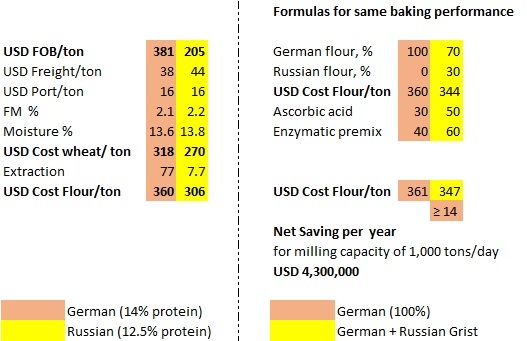 Picture below illustrates the potential savings per annum by switching from a 100% German grist to one that contains a blend with 30% Russian. The spread in the FOB price and the resulting cost per ton of flour opens a window of opportunity, allowing a 70:30 combination to perform on an equal footing in terms of quality, performance, stability and fermentation tolerance. Experience has shown this can be achieved by incorporating micro ingredients to the value of USD 3, which in this example generates a delta saving of USD 14 per ton of flour and a substantial benefit to the bottom line. From a more contextual viewpoint, the wheat procurement officer deliberating about switching from his current wheat to one than that is USD 30, USD 20 or even USD 10 less expensive might want to consider that an enzymatic solution somewhere in the range of USD 5 – USD 10 of micro ingredients in the vast majority of cases will be able to bridge the gap in quality. It will not only drive down wheat purchasing costs but also drive up profitability. In essence, the concept of unlocking full baking potential of flour is based in rationalizing and utilizing knowledge of wheat costing, wheat quality and understanding enzyme functionality to be able to produce flour with desired characteristics in a cost-effective manner. A constant challenge for millers is to produce flour with consistent baking properties. In addition, they face the challenge of manufacturing a large range of flour types and managing production costs. By supplementing flour with additives and processing aids, millers can address these issues. Success of flour correction depends on close cooperation between flour mill and flour buyer (industrial bakery, artisan bakery, pasta factory, biscuit factory, frozen dough producer, etc.). good knowledge of end user needs and requirements regarding flour quality. and expertise to manage flour functionality to achieve the desired properties. Ingredients used at flour mills and bakeries are often the same. The main difference lies in the dosages range: 10-100 ppm at the mill; > 100 ppm at the bakery. It is therefore, critical to maintain dosage levels of enzymes and other micro ingredients being incorporated at the flour mill to moderate amounts to realize efficient flour correction and prevent their overdosing at the bakeries. Enzymes not only aid in flour improvement, but also in providing an efficient and natural way to cope with raw material cost and quality fluctuations.